Ocean Beach-opoly Board Game Is Coming to Town! The Ocean Beach MainStreet Association is excited to announce our Ocean Beach-opoly board game. 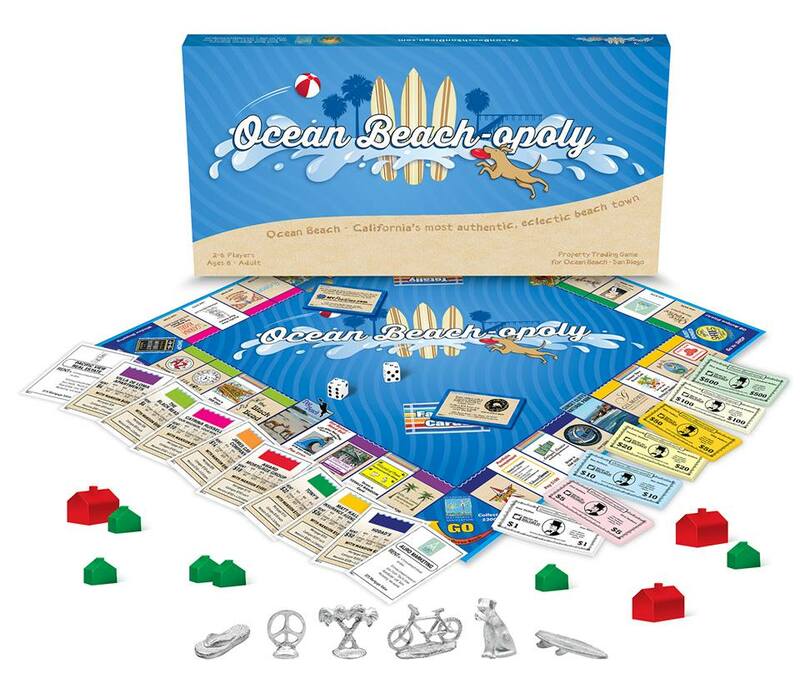 An exclusive Monopoly-based game built around our very own beloved Ocean Beach! The game certainly reflects the quirky and colorful nature of Ocean Beach, California’s most authentic, eclectic beach town. We’d like to thank all the local businesses who helped make Ocean Beach-opoly a reality. And, we must say a huge thank you to all the local service groups, non-profits and organizations that contribute to our active, involved community in so many ways – volunteerism is huge in Ocean Beach and it provides a solid footing for our neighborhood co-existence. We are lucky enough to live in a beautiful area with Mission Bay to our north, Cabrillo National Lighthouse to our south, downtown San Diego to our east and the endless wonder of the Pacific Ocean to our west. Games will be sold throughout the community in time for the holiday season. Here’s how to play: We are going to post a photo every weekday (Monday – Friday) from November 11 – 26 (12 photos total) at a local business and participant of the Ocean Beach-opoly game. The first person to guess the merchant based on the provided clues correctly in a comment will earn one point and that day’s contest will be complete. Photos will be posted between 9 a.m. and 5 p.m. The winners will be announced daily through the OBMA Facebook page as well as the Ocean Beach-opoly Challenge Event Page. Whoever has the most points at the end of the challenge wins an Ocean Beach-opoly game! Rule #1: You can only guess once per photo. Your first comment will count as your official entry. Rule #3: The first person to correctly comment with the name of the business on the photo will be the winner for that day. All photos will count as one point, for a total of 12 points. Rule #4: In the case of a tie, the Ocean Beach MainStreet Association will notify all finalists and have a third party pick a name at random. Rule #5: Have fun and visit our local shops & restaurants in OB to show your support! Ashley Pingree Lewis designed the logo for the game. I want to buy a Ocean Beach-opoly Board Game. Where will it be sold and how much will it cost? Newer Article: The OB Rag Is Back!